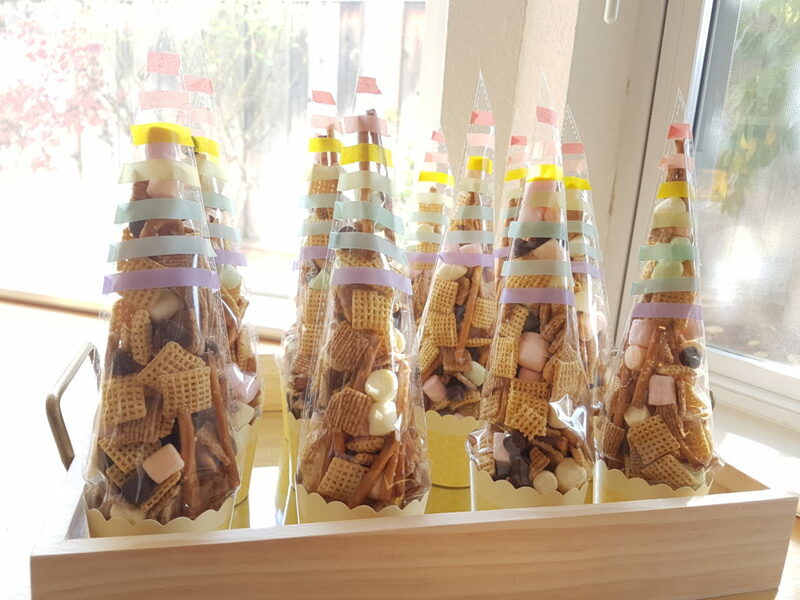 It’s a yummy s’mores snack mix served in rainbow-decorated cone treat bags! These are EXTRA special because I think I might have come up with something ORIGINAL to contribute to the beautiful unicorn world of Pinterest!!! That’s a pretty big blogger accomplishment! At first, I was just looking for an excuse to use those colorful pastel marshmallows since they looked pretty. I was searching along the “Unicorn Poop” theme, but nothing really stood out to me as something pretty and yummy-looking. I guess it doesn’t help that I don’t actually like these fruit-flavored marshmallows. They were a hit! Not only did they look great in the “horns” that I displayed them in, but the kids could not stop snacking on them all throughout the party. In addition to the unicorn horn display, I had set out an open bowl of the same snack mix with little snack cups for easier access. Even with a unicorn cake, chocolate-dipped marshmallow wands, banana cream pie and Pirate’s Booty on the table, they kept coming back for more of the s’mores snack mix. Once we got the Chex mix in, it was just a matter of getting them to stand up straight like horns. I tried righting them in muffin tins, but the sides weren’t high enough and they kept tilting. Then I remembered these cupcake wrappers I’d picked up at Home Goods a while back. 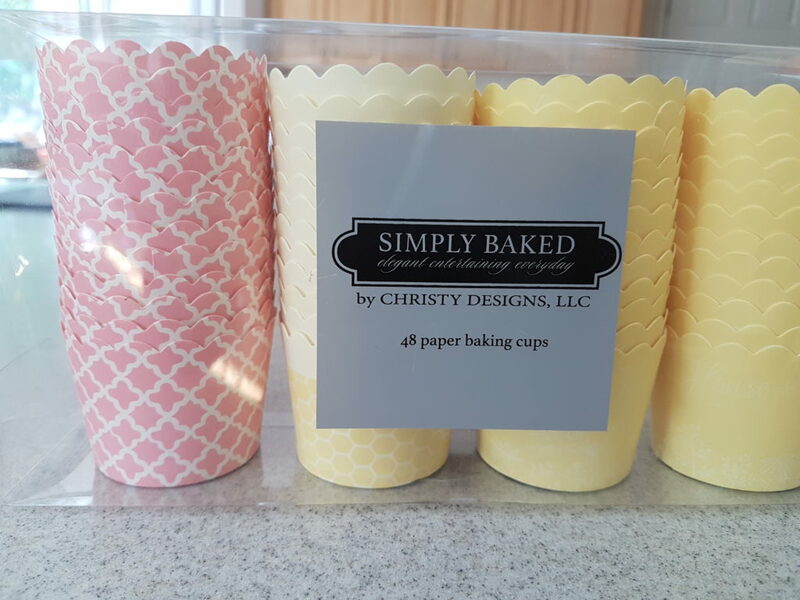 They are sturdy little cups you can put baked cupcakes into after they’re all done and baked–kind of like wrapping paper for cupcakes (not to be confused with cupcake liners). Mine were a simple yellow color, but there are some really cute ones online! 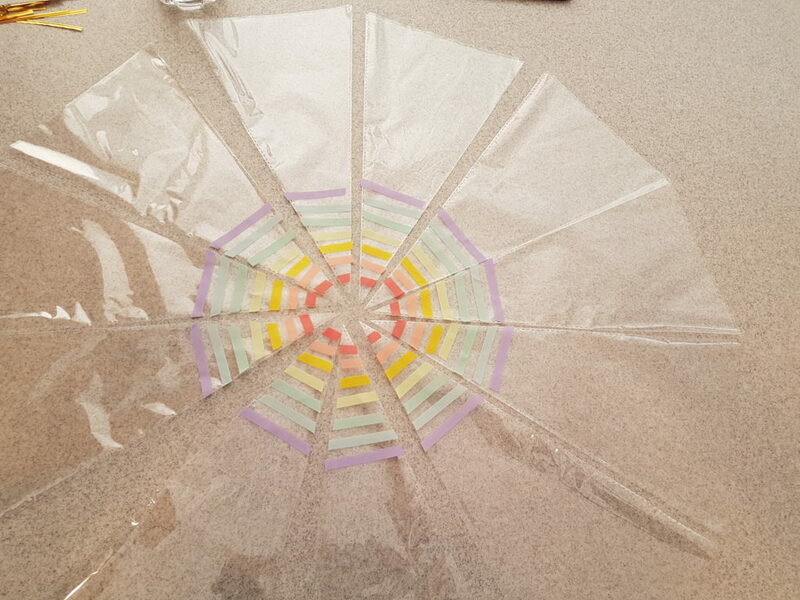 Once I twisted the bags closed and pulled the cellophane back, they were very easy to put into the cupcake wrappers and stood up straight the way I wanted. Hooray! 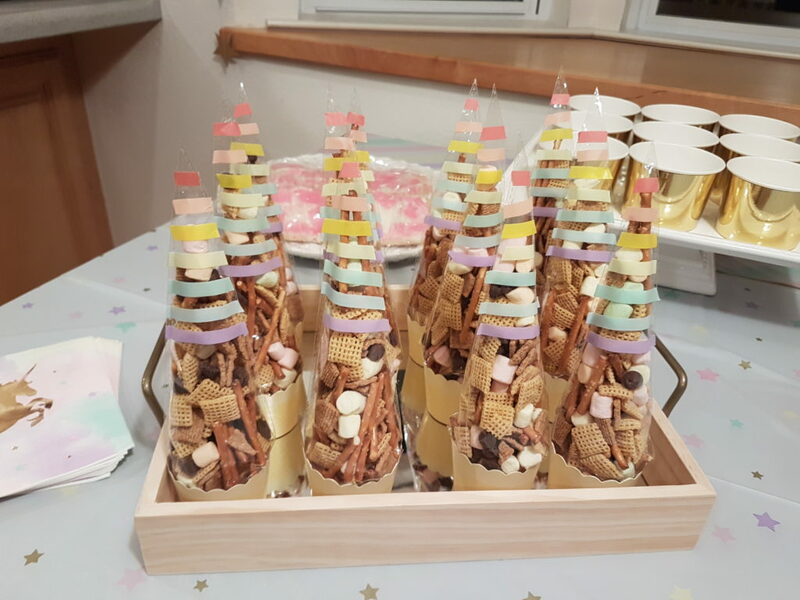 At the party, the magical unicorn horns made for a lovely display and take-home snack, and the extra bowl of the same s’mores snack mix was the most popular snack by far. 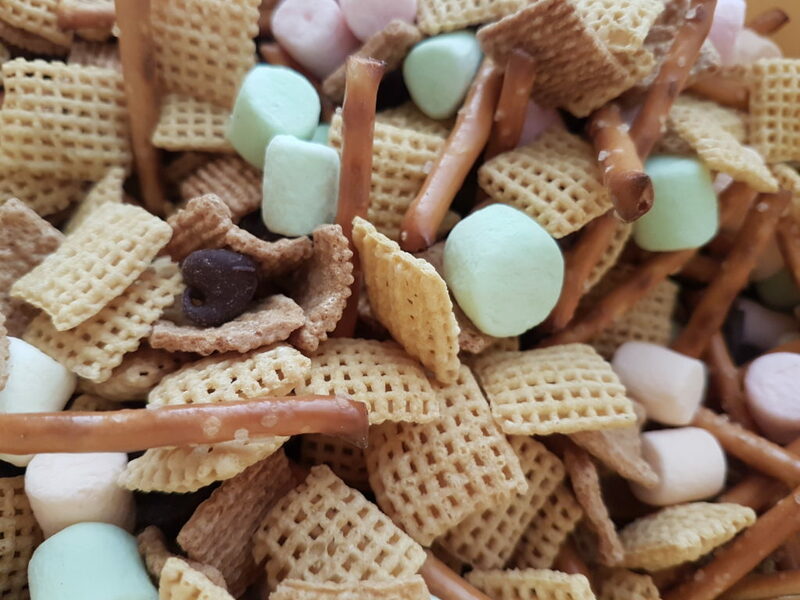 Later that week, I made some of the same snack mix for the parents in my son’s co-op (minus the marshmallows) and people came back for seconds and emptied the bowl in no time. It’s pretty addictive! So whether or not you’ve got a unicorn theme going on, this snack mix is sure to be a favorite at any event you go to. Who doesn’t like a mix of crunchy, salty, and cinnamony s’more sweetness to snack on? It’s easy and it’s yummy, give it a try! *To be honest, the colorful miniature marshmallows are not my favorite. They come in weird artificial flavors like orange, strawberry, lemon, and lime… which don’t really mix that well with chocolate or graham crackers. But if it’s for a little kid’s unicorn party, the colors really add some pizzazz and most kids aren’t going to notice the flavor weirdness. It’s totally worth it for the pop of color! I just picked the marshmallows out of my own cup of snack mix. This looks like a great party! Love it.